- On the inside of the collar is the motto "Rot isch unseri Liebi, Blau die ewigi Treui, Basel unseri Stadt." This roughly translates to "Red is our love, blue the eternal loyalty, Basel our city." 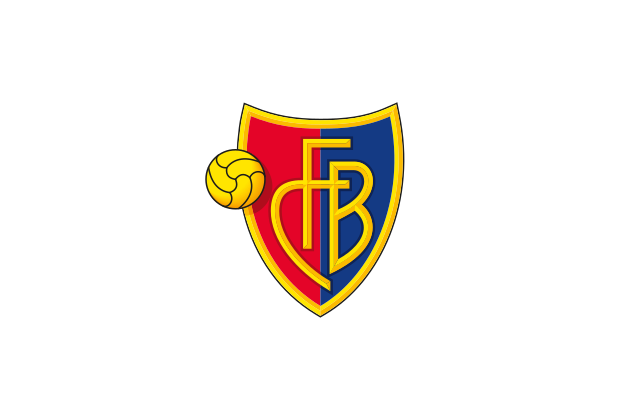 Between the text are two graphics; one of the FC Basel logo and the other being the coat of arms of the city of Basel. Surprisingly this shirt wasn't the first Swiss shirt that I bought for my collection. It is very easy to pick up a Basel shirt in the UK which meant that I could take my time when it came to buying a shirt from them. This shirt has a cool design, with the half and half split. I would prefer for the club logo to be located over the left breast though. The famous "Blaugrana" colours of FC Barcelona are said to have originated from the "Rotblau" colours of FC Basel. FC Barcelona was founded by former FC Basel captain Joan Gamper. For the 2008/09 season, Basel changed their shirt to resemble the traditional Barcelona shirt (red and blue vertical stripes). Barcelona changed theirs to one half of the shirt red, the other blue, which happens to resemble the traditional FC Basel shirt.